So far, mobile applications have been used primarily as a source of information and feedback. But now there is an increased integration between different restaurant offerings with mobile platforms in the areas like customer loyalty, placing orders and making payments and also promotional activities etc. For instance, Chaayos, a restaurant serving tea, uses the popular web chat platform, ‘Whatsapp’ to take orders and customer feedback thereby making the process simpler and less intrusive for the customer. And the trend is bringing the customers closer to the restaurants. What has prompted the trend? Research says many restaurants and the online food ordering and table reservations websites are moving towards the platform called Electronic Reservation Book (ERB) and are integrating Point of Sale (POS) and Androids in their businesses. Even few technology investments are no longer limited to just backend operational initiatives or POS systems. Restaurants are turning to technology investments that directly improve guest experience. Also online orders and reservation platforms are partnering with restaurants on ERB. According to a recent international study by Technomic on ‘consumers facing technology’, consumers use integrated mobile technology into their dining experience especially if it speeds up the process of getting their meal or paying their bill. On the other hand, Lite Bite Foods are implementing Airline Control Programme (ACP) in their company to streamline the entire sourcing, selling and indenting. Pizza Corner, the pizza chain in India has recently introduced mobile app ‘Today’ through which customers can order Pizza on just a single click. The user-friendly application helps customer access single detail information. The application is currently available to all Android users and will soon be available on the IOS platform. Who are the solution providers? With growing demand of such apps, companies like Blynk and MyPref in India have created apps to find and order food by using mobile apps being downloaded free. MyPref has introduced a new smartphone app allowing foodies to search and locate specific food items and the restaurants. MyPref makes the guesswork out of a specific menu by providing reviews for each dish. The app is available on Android and iOS smartphones and its download is free. Even QSR chains like Dominos, Pizza Corner, Starbucks, McDonalds, and Dunkin’ Donuts have also created their own mobile app to make the online food business much simpler and easier. There are now numerous POS platforms that leverage the iPhone and other mobile devices, including Android-powered smartphones and tablet computers like the iPad, so that restaurants can process payments in the field with a credit-card reader. The readers either attach to mobile devices of the operator’s choice or accept payment through mobile applications like Google Wallet. Atchayam Foodbox, a Chennai based automated restaurant is also using mobile phones applications to make the payment gateway easier. The diners can pay through credit or debit card by switching to the POS platforms on their iPhone and smartphone devices. Highlights from the article in Hotel Managers Group Blog. Almost nothing stays the same forever. In the hotel business, you have to change if you want to keep up with the competition. In 2013, preferences of travelers may be different over whether it is better to have an Apple or an Android digital device. But, on one point, there is no argument at all. Travelers, all across the world, and right here in the United States, have become increasingly dependent on their mobile digital devices. According to a combined study recently completed by travel marketing, research and consulting groups MMGY Global and the Harrison Group, the next generation of travelers has arrived. Results of the national survey entitled 2013 Portrait of Digital Travelers were released in August of 2013. 1. Smartphone usage for planning and purchasing travel services has more than doubled from 23 percent in 2011, to 62 percent in 2013. That is a fractional increase of roughly 270 percent in just 2 years. 2. Tablet usage for planning and purchasing travel services has gone up six-fold from 2011 to 2013. In 2011, only 7 percent of households were using tablets for travel, while in 2013, the number surged to 42 percent. 3. Over 50 percent of the Digital Elite have children in their household, compared to only 37 percent of those who rely on more traditional methods to plan and book travel. This reflects that younger people tend to be more digitally connected, and even children of 10 or 12 years of age, get actively involved, through the internet, to help plan a family vacation. 4. Digital Elite travelers spend and do more than their not-so-well connected brethren of travelers in 2012. At Blynk, we love reading about technology and one of our favourite websites is The TechPanda. So of course we are excited to share that they recently wrote an article about Blynk. When wives meet, they chat sarees, kids and husbands. And more often than not, they insist the resisting husbands to meet up, atleast once. Vishal & Sunny’s wives were friends and managed a local charity. Upon their insistence, the husbands met, and the rest they say is history! Blynk has found a need in niche hospitality segment and high end hotels would be definitely willing to have apps complement their premium service. A strong team and a definitive target market are Blynk team’s assets. So proud to announce that Blynk Hotel’s new user interface design gets profiled on one of the most respected UI design websites – Behance. Check out more screenshots on Behance of our new UI here. 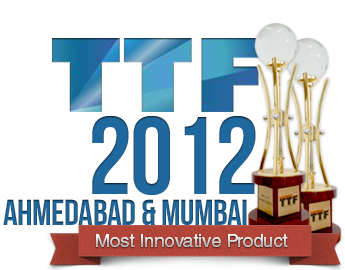 We are proud to announce that Blynk Hotel was awarded ‘The Most Innovative Product’ back-to-back at both TTF Ahmedabad and TTF’s 100th show at Mumbai.